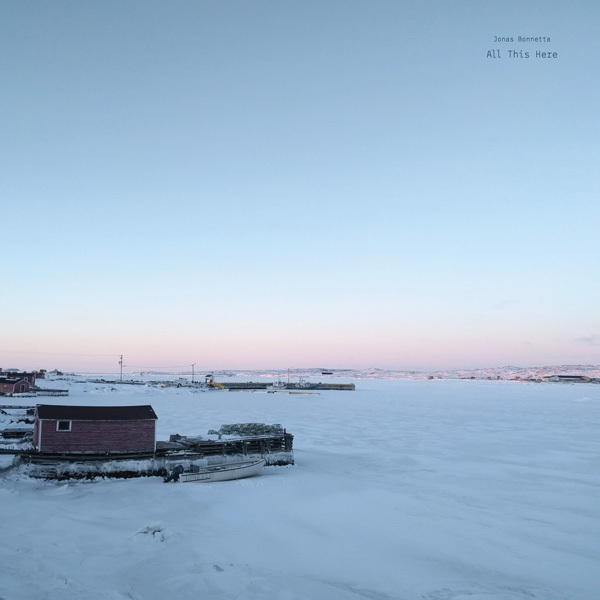 Today, Jonas Bonnetta is sharing the video for "Seldom", the new track from his upcoming ambient album, All This Here, which captures the dawn, dusk, and everything-in-between of life on Fogo Island. The song “grew out of processed field recordings made around the Squish Studio in Tilting,” says Bonnetta. “I processed those using max/msp and then wrote the piano piece on the Yamaha C7 grand piano that lives at the Fogo Island Inn. I would use the processed field recordings as inspiration to guide the music. When that was all finished, I shipped it off to my friend Anne Müller, an amazing cellist that lives in Berlin, and she added the strings on the end." “Seldom” saw its broadcast premiere yesterday courtesy of the Strombo Show. Over the past few years, Jonas Bonnetta has used the time in between touring and performing as Evening Hymns to record his first full-length ambient album, All This Here. The record began as the score to the documentary film Strange And Familiar: Architecture On Fogo Island which follows the story and construction of the Fogo Island Inn and a series of artist studios on the island designed by architect Todd Saunders. The album finds field recordings from the coast of Fogo Island echoing throughout the record, horns which glisten into strings or shimmer apart into the rumble of surf. Forlorn murmerings suggest some alloy of whalesong and cello, while particles of recorded footfalls collide in the vacuum of wind or woodwind and cold, watery piano tones. The writing process for the tracks on All This Here often began with field recordings; a dog barking in the distance, footsteps in the snow, a microphone hung in a juniper bush in the wind, the icy waves rolling up against the rocks outside the Fogo Island studio. A process which Bonnetta compares to type of foraging, a hunt for treasures in the forest, then assembling the fragments into a vision of something stubbornly pure. The recordings were captured partly in and around an artist cabin perched over the ocean on Fogo, on the Easternmost tip of Canada, and partly at Bonnetta’s Ontario countryside home studio, with the help of Anne Müller (Nils Frahm, Agnes Obel) and Mika Posen (Timber Timbre, Agnes Obel) on strings, and mastering by Philip Shaw Bova (Feist, The Belle Orchestre). The result of Bonnetta’s time capturing the architecture and environment of Fogo Island is something that feels more found than constructed, a buried memory recovered whole, embedded with sounds from the island and music inspired by that beautiful place. Currents merged into a single, sprawling field recording, a map of physical and emotional landscapes in superposition. Each tidal movement flows into the next, and arrangements wash themselves away, slowly exposing the haunted, haunting spirit of a place that exists only for a moment. Bonnetta will celebrate the release of All This Here with a special performance at The Drake in Toronto on May 27. Joining Bonnetta on stage will be Edwin Huizinga (Tafelmusik, Yo Yo Ma, Wooden Sky), Mika Posen (Timber Timbre, Agnes Obel), and Adam Saikely (Acorn, Telecomo). All This Here sounds like a record of dawn and dusk, of light that frets at the edge of the day. The album finds field recordings from the coast of Fogo Island echoing throughout the record, horns which glisten into strings or shimmer apart into the rumble of surf. Forlorn murmerings suggest some alloy of whalesong and cello, while particles of recorded footfalls collide in the vacuum of wind or woodwind and cold, watery piano tones. Bonnetta will celebrate the release of All This Here with a special performance at The Drake in Toronto on May 27. Joining Bonnetta on stage will be Edwin Huizinga (Tafelmusik, Yo Yo Ma, Wooden Sky), Mika Posen (Timber Timbre, Agnes Obel), and Adam Saikely (Acorn, Telecomo). Tickets for the show are available here. More performance dates will be announced shortly. The writing process often began with field recordings; a dog barking in the distance, footsteps in the snow, a microphone hung in a juniper bush in the wind, the icy waves rolling up against the rocks outside the Fogo Island studio. A process which Bonnetta compares to type of foraging, a hunt for treasures in the forest, then assembling the fragments into a vision of something stubbornly pure.